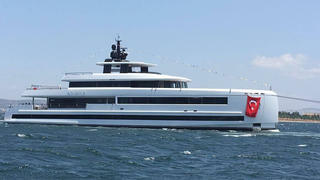 Turkish yard Mengi Yay Yachts has launched a new 45 metre superyacht called Aquarius, which has set off on pre-delivery sea trials. Built from wooden laminated epoxy, this new tri-deck displacement yacht was previously known as Hull NB93 and splashed over the weekend (June 25) at RMK Marine in Tuzla. Her sleek exterior is courtesy of Oğuzhan Güler is dominated by straight lines drawing the eye to her almost vertical prow. Engineering is by long-time Mengi Yay Yachts collaborators Ginton Naval Architects. Aquarius’ interiors were created by BTA Design and feature a total internal volume of 300 gross tonnes. Styling cues include deep pile carpets, elaborate marble surfaces in the en-suite washrooms and oriental influences throughout. Accommodation is comprised of a master cabin, four guest cabins and four crew cabins for a total staff of eight. Exterior relaxation spaces on Aquarius include the aft beach club, which features port and starboard fold out sections and an extendable bathing platform, while the sundeck is dominated by a large sunpad situated aft of the hardtop. Power comes from a pair of 1,450hp CAT C32 engines, which can deliver a top speed of 15 knots. Mengi Yay Yachts adds that her cruising speed of 12 knots will deliver the maximum cruising range from the 33,000 litre fuel tanks. Built to RINA classification, Aquarius also features a fresh water capacity of 8,000 litres and three generators with a total output of 157.5kw. Other projects currently under development at Mengi Yay Yachts include Hull NB95, a 34 metre steel and aluminium superyacht that is due to launch in 2017.